"Relaxation is the key to track and field. 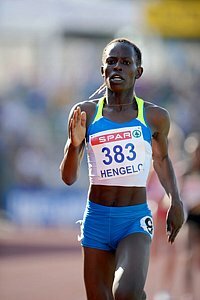 (Saturday when Gay ran 9.77) I was totally relaxed and let the time come to me. I may have pressed a little today"
-Tyson Gay after running the fastest 100 ever 9.68 (it was too windy for a world record). 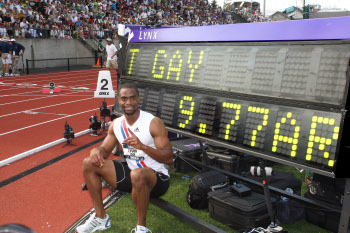 It's scary to think Gay can run 9.68 and not have it be his best race. Famed distance coach Arthur Lydiard said "relaxation is the key to running fast" and we're glad Gay agrees. *LRC Men's 5k Preview: Lagat Versus the Field It should be a hot one as 7 guys have the "A" standard and have shown they can run. Adam Goucher (11th at Worlds last year) doesn't have it, and may have to push the pace as a result. *LRC Men's 800 Final Preview: Everyone's Got a Chance It should be a great one. Khadevis Robinson and Nick Symmonds lead the US crop but Andrew Wheating and crew are right on their heels. *LRC Women's 800 Final Preview: Chaos 12 women will be in the final which is totally unprecedented nuts. Alice Schmidt and Hazel Clark are the favorites. *NY Times Article on Queen Quedith Earth Harrison Both her parents have been in prison and she has 22 siblings. Yahoo! Slideshow from US Trials. Chambers Runs 2 Olympic A Marks Including a 10.06 Chambers: "I will always remain a clean athlete from here onwards." $208,000 LetsRun.com Prediction Contest Change Your Picks Above. Check Your scores here.